Whether you need one on one coaching or large group presentations, our services cover all size groups. Interactive workshops work best with 25 people or less per trainer. We charge $1,000 per full day and $650 per half day. Fees for travel and materials dependent on needs. Contact us if you have budget concerns. We’ll try to work with you. Supportive materials are provided for virtually all workshops. Our Train-the-trainer workshops include materials to replicate the activities. What does your free needs assessment include? Depending on your needs, we will conduct an assessment either by phone or in person to determine what issues exist in your organization and what types of services would most benefit your situation and budget. Our office is located in Westchester, NY. Our trainers will travel anywhere their services are needed. What grade levels do you work with in your school programs? We have worked with every grade from pre-K through graduate school, including special education populations. You can call us at (917) 902-2754. 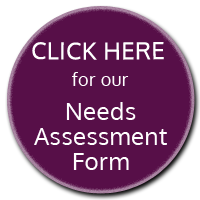 Take our online needs assessment and we’ll call you!